How smart machines are transforming us all - and what we should do about it. The smart-machines revolution is re-shaping our lives and our societies. Here, Nigel Shadbolt, one of Britain's leading authorities on artificial intelligence, and Roger Hampson dispel terror, confusion, and misconception. They argue that it is human stupidity, not artificial intelligence, that should concern us. 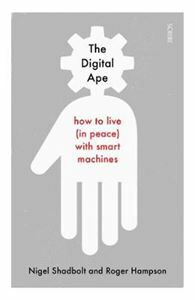 Lucid, well-informed, and deeply human, The Digital Ape offers a unique approach to some of the biggest questions about our future.